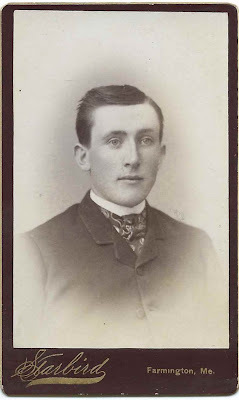 Two identifical c1880s Cartes de Visite of a young man identified on the reverse as Bertram H. Lidstone of Farmington, Maine, who died on January 9, 1886 at age 21. 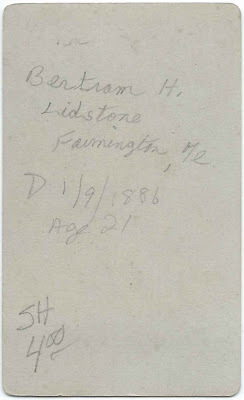 A baptismal record for Bertram Howard Lidstone shows that he was born May 2, 1864 and baptized at O'Leary United Church on Prince Edward Island on July 18, 1867, along with at least two other siblings. Bertram's parents were Rev. 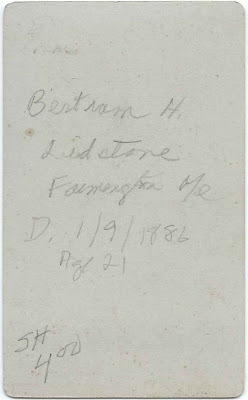 James Lidstone and Catherine (Dalton) Lidstone, who were both born on Prince Edward Island, James at Bedeque or Cape Wolfe. James and Catherine had married on January 9, 1862 on Prince Edward Island, according to a record in Prince Edward Island Marriage Registers, 1832-1888. The family was living at Sackville, New Brunswick at the time of the 1871 Census. 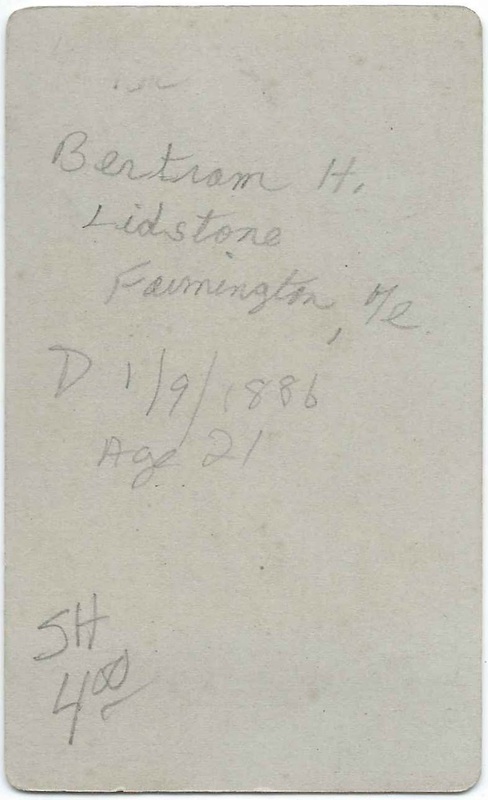 James Lidstone's naturalization record indicates that the family, or at least James, had moved to Maine by 1873. The family ultimately moved to Farmington, Maine, presumably where Rev. James Lidstone had found a church to minister. 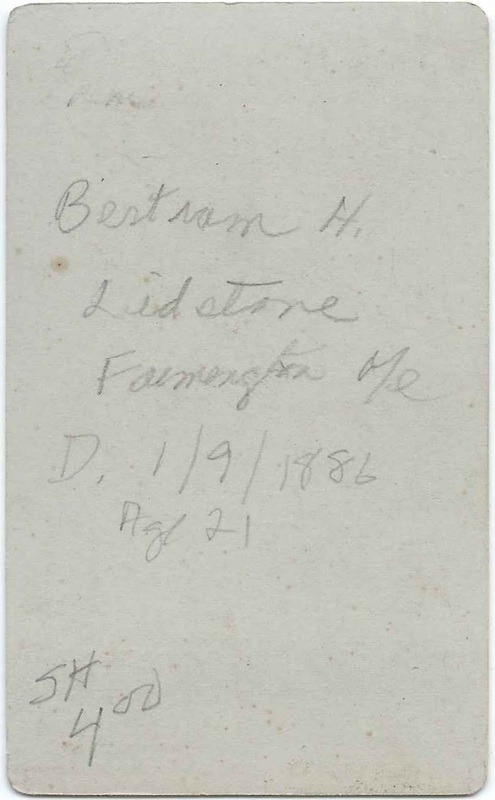 Sister Eugenie Bertha Lidstone, born December 14, 1866 at Prince Edward Island, died in 1883. These five and Bertram himself are buried in the Riverside Cemetery at Farmington, Maine. 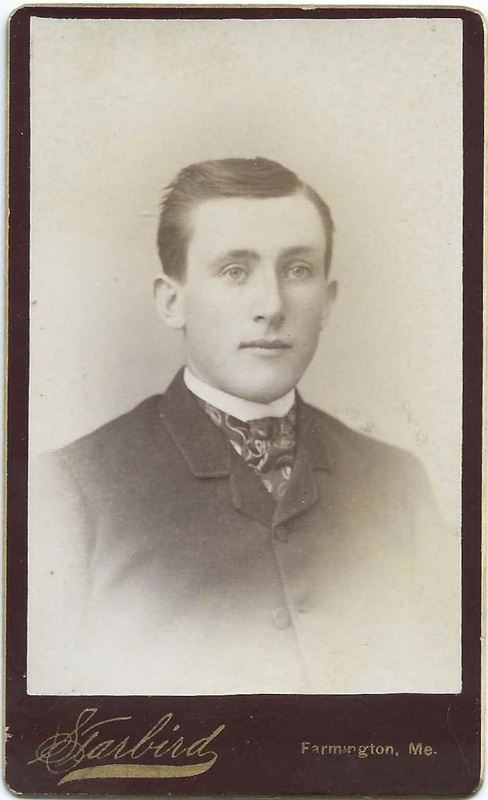 There was another child, Richard Lidstone, born May 8, 1872. I don't have further information on him, except that he may have been the Richard L. Lidstone who also died young, on October 13, 1899. He's buried in the Pomona Cemetery and Mausoleum at Pomona, California.